» Schedule your tour today! 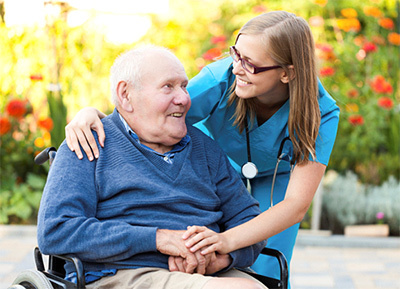 Rehabilitation services such as physical therapy, occupational therapy and speech therapy, as well as medical care services such as visiting nurse and wound care, are able to be provided at Carriage Hill Assisted Living. Our nursing staff will refer residents and their family members to recommended service providers or residents may use any licensed provider of their choice. These services are ordered through a resident’s physician and are billed through medical insurance. Carriage Hill offers a Medical Treatment Room where these services can be provided to maintain a separation between their bedroom (home) and medical care. The ability of these services to be provided at our residence can facilitate and expedite a resident transitioning from a rehabilitation facility or returning home to Carriage Hill after a rehabilitation facility stay. Rehabilitative services are an important component in maintaining or regaining overall health, functionality and independence for seniors following a medical event. For more information about rehabilitation services, or assisted living seacoast NH, contact our clinical staff at (603) 343-4475 or info@carriagehillassistedliving.com. © Carriage Hill. All Rights Reserved.